No.1 was a 4-4-0 American type built in 1869 by the Pennsylvania Railroad's Juniata Locomotive Shops in Altoona, PA as their No.322. It served as a passenger and freight locomotive for many years before being retired in the 1890s, being replaced by larger power. 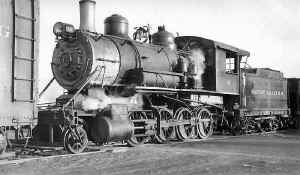 While on the PRR it belonged to the C class and in 1895 it became part of the D-3 class. The NY&NO purchased No.1 along with Nos. 2 and 3 in 1898 for passenger and freight use. No.1 arrived after Nos. 2 and 3, in 1899. No.1 arrived inoperable and it was reconditioned to operation. During 1899 the NY&NO found itself with no customers when the factories in New Orange shut down from an industrial recession. Nos.1-3 were therefore used infrequently, and only used to pull the passenger trains to the CNJ. The NY&NO was foreclosed on November 8, 1900 and was sold to the New Orange Four Junction Railroad on February 16, 1901. 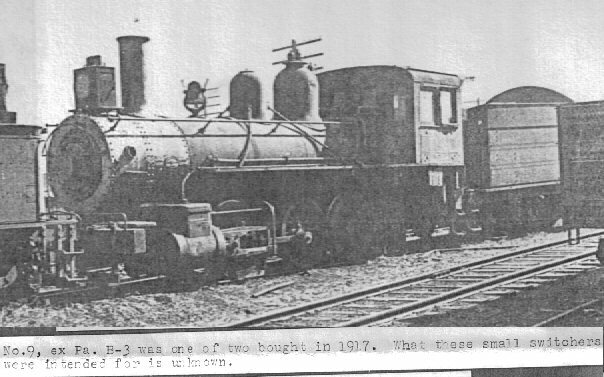 No.1 was rarely used while under the ownership of the NOFJ, with No.3 being the preferred locomotive. Nos.1 and 2 were scrapped in 1903. No.2 was a 4-4-0 American type built in the 1870s by the Pennsylvania Railroad's Juniata Locomotive Shops in Altoona, PA. 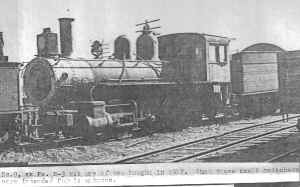 It served as a passenger and freight locomotive for many years before being retired in the 1890s, being replaced by larger power. While on the PRR it belonged to the C class and in 1895 it became part of the D-3 class. The NY&NO purchased No.2 along with Nos. 1 and 3 in 1898 for passenger and freight use. During 1899 the NY&NO found itself with no customers when the factories in New Orange shut down from an industrial recession. Nos.1-3 were therefore used infrequently, and only used to pull the passenger trains to the CNJ. The NY&NO was foreclosed on November 8, 1900 and was sold to the New Orange Four Junction Railroad on February 16, 1901. 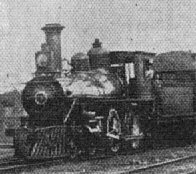 No.2 was rarely used while under the ownership of the NOFJ, with No.3 being the preferred locomotive. Nos.1 and 2 were scrapped in 1903. No.3 was a 4-4-0 American type built in the 1870s by the Pennsylvania Railroad's Juniata Locomotive Shops in Altoona, PA. It served as a passenger and freight locomotive for many years before being retired in the 1890s, being replaced by larger power. While on the PRR it belonged to the C class and in 1895 it became part of the D-3 class. The NY&NO purchased No.3 along with Nos. 1 and 2 in 1898 for passenger and freight use. During 1899 the NY&NO found itself with no customers when the factories in New Orange shut down from an industrial recession. Nos.1-3 were therefore used infrequently, and only used to pull the passenger trains to the CNJ. The NY&NO was foreclosed on November 8, 1900 and was sold to the New Orange Four Junction Railroad on February 16, 1901. No.3 became the preferred locomotive of the NOFJ and on March 1, 1905, along with the NOFJ, No.3 was purchased by the Rahway Valley Railroad. It was the only locomotive to serve each railroad, the NY&NO, the NOFJ, and the RV. No.3 was unfortunately wrecked in a crash in 1906 and was scrapped. 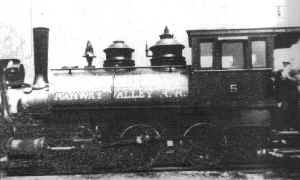 No.4 was the first locomotive purchased by the Rahway Valley Railroad, and it is unclear if it was numbered 4 right away, or after the NOFJ was purchased in 1905. In any case, No.4 was purchased from the Delaware Lackawanna and Western Railroad in 1904. No.4 was a member of the Lackawanna's 300 class built in 1870 by the Dickson Locomotive Works. By the time it arrived on the RV it was already 34 years old. No.4 was what railroaders would call a "tea kettle" for it's small size and low pulling power. No.4 was always in poor condition and after the purchase of Nos. 5 and 6 in 1905, and No.7 in 1908 it saw little use. 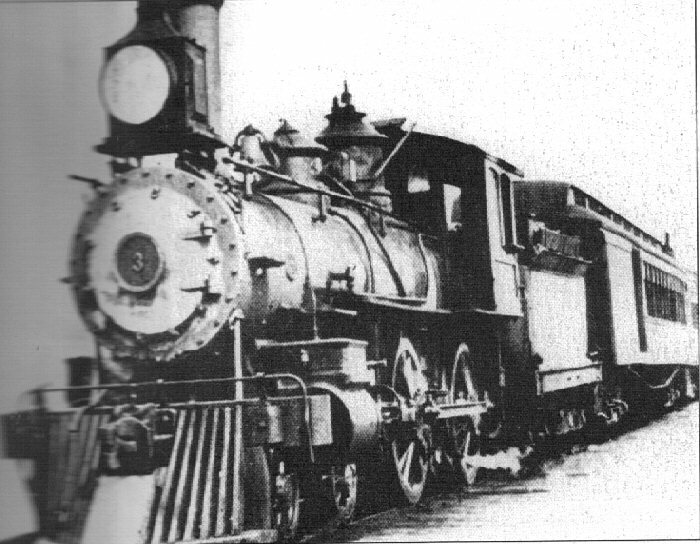 No.4 did handle the effort to remove the soil of Tin Kettle Hill and sell it to the PRR. An examination of the locomotive in 1909 revealed that the boiler needed repair and needed a hydrostatic test, and the flues and steam gauges needed to be replaced. No.4 saw use as a track maintenance locomotive and helped to build the branch to Maplewood in 1911, and then raise it in 1915-1916. No.4 saw more use in the rush of World War I period of 1914-1918 when there was much activity on the line. No.4 was scrapped in 1918. No.5 was one of five identical locomotives built from 1880 to 1882 for the Central Railroad of New Jersey, No.5 was the last to be built in August 1882. No.5 was originally numbered 23 on the CNJ until 1903 when it was renumbered to 710, the identical switchers became 705-709. 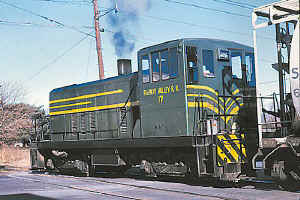 No.710 performed switching chores for the CNJ until it was purchased by the Rahway Valley Railroad in 1905. No.5 was soon accompanied by SIRT No.6 which was also purchased that year by the line. No.5 was great for light switching jobs and it also handled the smaller passenger trains, but it had difficultly with the 4% grades up to Summit. When rail-buses were acquired in 1911, No.5 was basically put out to pasture. No.7 handled the long passenger trains, which were now infrequent, No.6 handled freight, and the rail-buses got most of the time on the passenger trains. No.5 was put into storage with the infrequently used No.4. When the first rail bus was scrapped in 1914 and the other retired the regular steam powered passenger trains came back. No.5 was put back into service and the beginning of the first World War gave all four Rahway Valley locomotives work. After the end of the war in 1918 and the bringing back of the railbus in 1919, No.5 was kept as backup to the railbus until Roger Clark pulled the plug on all passenger trains in 1922 and No.5 was sold to a contractor. Who knows, maybe old No.5 is around, somewhere. Of all the Rahway Valley Railroad locomotives, No.6's story has been the hardest to determine. I have found two sources that agree that No.6 was from the Staten Island Rapid Transit line, a New York commuter railroad. One source says that No.6 was a 2-4-0, but going by the fact of how little that configuration was used, I am going to go with the other source stating it was a 2-4-4, commonly referred to as a Mason Bogie. No.6 was acquired by the Rahway Valley in 1905 and was used mainly for passenger use. 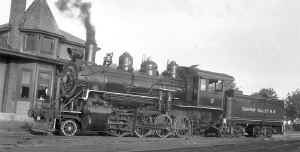 Until 1908, No.6 was the main passenger locomotive. That year brand new No.7 was acquired, and No.6 was most likely used in tandem with No.7, as at this time there we 14 passenger trains a day. By 1909 daily passenger trains were down to six, so No.6 was only used when No.7 was down for repairs. In 1911 the rail buses were acquired and No.6 was put as a backup to them as well. In 1914, the railbuses were done away with, and World War I started. Nos. 4, 5, 6, and 7 put in a lot of overtime hours drilling the line for passenger trains, freight trains, and trains of workers to the factories. There was so much work to be done that locomotives had to be leased for a time. Toward the latter part of the war Nos. 6 and 7 were purchased for use in Europe in 1917. No.6 might still exist somewhere, who knows. 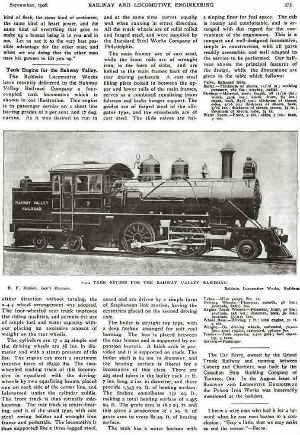 No.7 has a specific distinction on the Rahway Valley Railroad, it was the only new steam locomotive on the line. 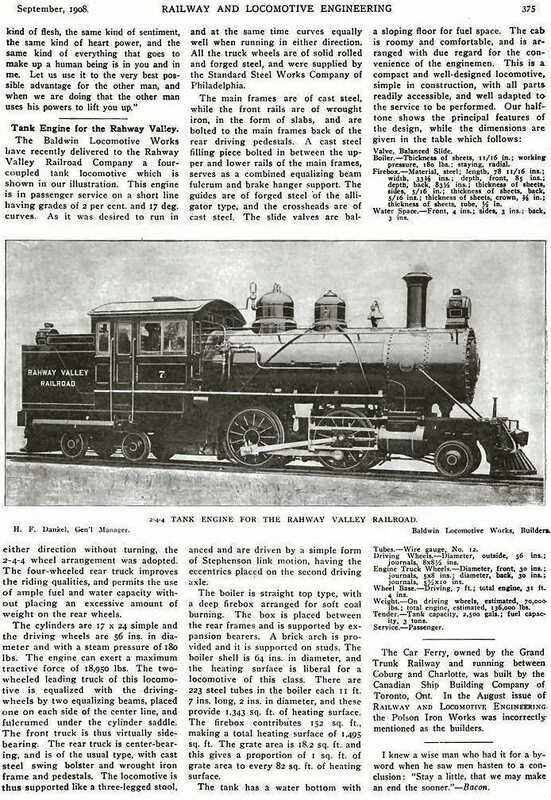 In 1908, Louis Keller contracted with the Baldwin Locomotive Works in Philadelphia, NY to build a high stepping locomotive for his line. No.7 arrived new from the factory and quickly became the pride and joy of the crew. It was also the most used engine on the line. It could easily negotiate the tight curves and steep grades of the Rahway Valley. Management attempted to replace No.7 in 1911 with two rail buses, but venerable No.7 was still used for the larger passenger trains that the buses could not handle. In 1914, the rail buses were done away with and No.7 continued working the passenger trains. When World War I broke out in 1914, business picked up greatly on the line, and No.7 was definitely kept busy. No.7 worked for nine years on the line before being sold in 1917 and shipped off to Spain. It later was shipped to Brazil and worked the logging trains in the rain forest there up until World War II. Who knows, maybe this locomotive still exists in some third world country, Cuba still operates steam locomotives I believe. No.8 was the first of three locomotives acquired in the World War I rush of 1914-1918. No.8 was built by the Pittsburgh Locomotive Works in 1900 to haul coal on the Pittsburgh and Lake Erie Railroad in Pennsylvania and served as their No.1772. It came east in 1916 when the Rahway Valley purchased it. No.8 was very reliable and saw much use on the line from 1916 to 1918. After the end of World War I things seriously slowed on the Rahway Valley and it sank into the red. At the end of the war in 1918 the Rahway Valley had Nos. 5, 8, 9, and 10. No.5 was rarely used only when the railbus was under repairs, and even that was on it's last legs. Nos. 9 and 10 were only used when needed, which wasn't often, only when No.8 required repairs. 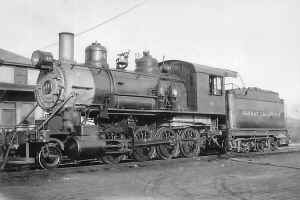 In 1920 Louis Keller purchased another locomotive, No.11. From 1920 until 1929 Nos. 8 and 11 were the workhorses of the railroad. Nos. 5 was sold in 1922 and Nos. 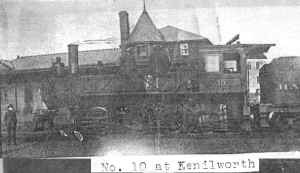 9 and 10 were sold in the 1920s to General Equipment Co. After Keller died in 1922, Roger Clark took over, the railbus was disposed of, and the roaring twenties were here. Clark began to pull the line out of it's pool of debt. Nos. 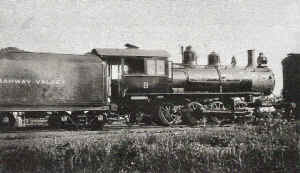 8 and 11 gradually saw more use and a third locomotive was purchased in 1927, No.12, which was too big for use on the line. No.8 stuck around for a while longer before Clark got enough money to invest in the purchase of two more locomotives, Nos.13 and 14, which replaced Nos. 8 and 11. No.8 was scrapped in April, 1929. No.9 was the second of the three locomotives purchased in the World War I rush. No.9 was built in November, 1893 at the Pennsylvania Railroad's Juniata Shops in Altoona, PA. It worked at the PRR's yards until it was purchased in 1917 by the Rahway Valley Railroad. No.9 was purchased along with identical locomotive No.10 to replace recently sold Nos. 6 and 7 and also for the war time rush. After the end of the war in 1918, No.9 saw very little use, only as a backup to No.8. By 1920 when No.11 was purchased, No.9 had almost completely lost all it's use on the Rahway Valley. Nos. 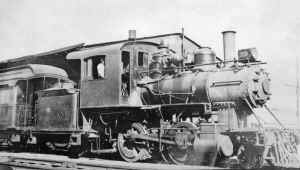 9 and 10 were sold to General Equipment Co. sometime in the 1920s after very short careers on the railroad. No.10 was the third of the three locomotives purchased in the World War I rush. No.10 was built in November, 1893 at the Pennsylvania Railroad's Juniata Shops in Altoona, PA. It worked at the PRR's yards until it was purchased in 1917 by the Rahway Valley Railroad. No.10 was purchased along with identical locomotive No.9 to replace recently sold Nos. 6 and 7 and also for the war time rush. After the end of the war in 1918, No.9 saw very little use, only as a backup to No.8. By 1920 when No.11 was purchased, No.10 had almost completely lost all it's use on the Rahway Valley. Nos. 9 and 10 were sold to General Equipment Co. sometime in the 1920s after very short careers on the railroad. No.11 was built new for a shortline, the Grafton and Upton Railroad, in February, 1904 by Baldwin. On the G&U it was numbered 5. 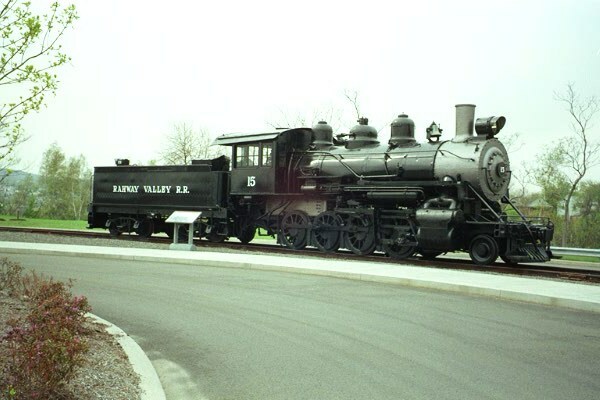 The sixty ton locomotive was purchased by the Rahway Valley Railroad in 1920 to essentially replace Nos. 9 and 10, which were 14 tons lighter than No.11. The locomotive was the second Mogul purchased by the railroad, and unlike it's predecessor No.11 worked well, and was reliable. The locomotive also had the added distinction of being the last locomotive purchased during the lifetime of Louis Keller. No.11 served along with No.8 during the 1920s hauling freight on a line highly in debt. Roger Clark came to the presidency of the line in 1922 and in 1927 he purchased another locomotive, No.12, but it was too heavy. Then in 1929, Clark had Nos. 13 and 14 purchased and they replaced Nos.8, 11, and 12. No. 8 was scrapped, No.12 was retired, and No.11 was put on standby for the day that Nos. 13 and 14 would both be in the shop. In about 1933, No.11 was brought in the shops for inspection and work and it was found that the locomotive was completely worn out. No.11 was retired and sidelined along with No.12. When No.15 was purchased in 1937, No.11 was immediately scrapped. If you worked for the Rahway Valley Railroad in 1928, you could describe No.12 in two words "BIG NUISANCE." No.12 started out as Bessemer and Lake Erie No.96 built in either 1902 or 1903 by the American Locomotive Company's (Alco) Pittsburgh Works. 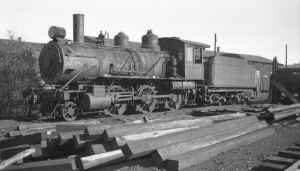 No.12 was an in and out coal hauling locomotive. 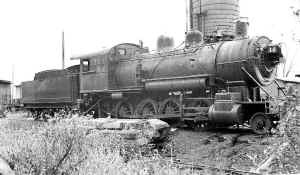 Then in 1927, Roger Clark had purchased the locomotive for the upturn in freight traffic. Clark obviously did not fully think out the idea of this 87 ton behemoth on his railroad's light 60 lbs. to the yard rail. No.12 worked well on the grades, there was no denying it that, but on the other hand, it split the rails, broke them, and crews prayed as the coal-hauler crossed the line's bridges. To give you an idea of how heavy this locomotive was for the little Rahway Valley, years later in the late-1960s, the Whippany based operation, the Morris County Central offered to run it's 0-6-0 Army Switcher over the RV for a few days. The RV had to decline, the locomotive was too heavy, and that locomotive weighs 79 tons, No.12 weighed in at 87 tons. When Nos. 13 and 14 were purchased in 1929, No.12 was immediately retired. No.12 may have operated a few times between 1933 and 1937 when No.11 was out of service and the line had no backup locomotive. No.12 lived the rest of it's life sitting dead on a siding in Kenilworth until it was finally scrapped in February, 1943. No.13 started life out as Lehigh & New England No.19. Rahway Valley Nos. 13 and 14 were two out of three members of the L&NE E-7 class, the other being L&NE No.18. All three were built in September, 1905 by Baldwin subsidiary, Burnham, Williams, and Company. No.13 worked reliably on the L&NE for 24 years before being sold to the Rahway Valley in 1929 along with No.14. They both replaced Nos. 8, 11, and 12 as the main locomotives on the RV. No.8 was scrapped, No.12 retired, and No.11 was put on as backup to the two new acquisitions. Nos. 13 and 14 got a new stablemate, No.15 in 1937. Nos.13 and 14 were the workhorses on the line, and No.15 served simply as a backup to them. The two twin consolidations became the symbol for the Rahway Valley, and No.13 worked reliably on the railroad for many, many years. No.13 finally lost out to new diesel power on January 29, 1951 when No.16 arrived on the line. No.14 was scrapped, and Nos. 13 and 15 were put in the shop for the day that the diesel would be down for repairs. Occasionally traffic was great enough that the diesel and a steam locomotive would work together on the same day. No.13 saw it's demise come when it was scrapped in 1952 after 47 years of faithful service. No.14 started life out as Lehigh & New England No.19. Rahway Valley Nos. 13 and 14 were two out of three members of the L&NE E-7 class, the other being L&NE No.18. All three were built in September, 1905 by Baldwin subsidiary, Burnham, Williams, and Company. No.13 worked reliably on the L&NE for 24 years before being sold to the Rahway Valley in 1929 along with No.13. They both replaced Nos. 8, 11, and 12 as the main locomotives on the RV. No.8 was scrapped, No.12 retired, and No.11 was put on as backup to the two new acquisitions. Nos. 13 and 14 got a new stablemate, No.15 in 1937. Nos.13 and 14 were the workhorses on the line, and No.15 served simply as a backup to them. The two twin consolidations became the symbol for the Rahway Valley, and No.14 worked reliably on the railroad for many, many years. No.14 finally lost out to new diesel power on January 29, 1951 when No.16 arrived on the line. No.14 was scrapped that year after 46 years of faithful service to two railroads. No.15 was built for a Tennessee short line, the Oneida & Western Railroad as their No.20. The engine was the pride and joy of the crew, and was often used. Then in 1926, a neglectful let the locomotive freeze overnight, and ice broke the locomotive's bridges. It was sent to Baldwin for repairs. And Baldwin strangely fitted the locomotive with outside piston valves, a new steel pilot, a new reverse mechanism, and a lubricator. The locomotive went back to work in the hills of Tennessee for another eleven years before it was deemed surplus and put up for sale. Master Mechanic Carl Nees, Charlottesville, VA native, was sent to look over the locomotive, and he had it purchased for the Rahway Valley. The southern girl came north and soon the crew took a liking to her. Engineer Frank Froat really liked the sound of her southern whistle, and could toot it like no one else. No.15 was only a backup to Nos. 13 and 14 though. They were real workhorses, and in the winter they were the preference for their full wrap around cabs, which No.15 did not feature. While No.15 was not the workhorse, it certainly was the prettiest locomotive of the line. Diesel power arrived on January 29, 1951, in the form of GE 70 ton switcher No.16. No.14 was scrapped, and Nos.13 and 15 put on standby to the diesel for the day it would be in the shop, or when traffic was heavy enough for two locomotives. No.15 lost it's longtime steam stablemate, No.13 in 1952 when it was scrapped, but No.15 was retained for the same purpose it had always had on the RV, backup. No.15 operated for the last time on the RV on November 28, 1953, when No.16 was down for repairs. A second diesel, No.17 arrived on February 2, 1954, and steam was permanently retired on the RV, 56 years after Nos. 2 and 3 arrived at Aldene Junction. George Clark did not want to see No.15 go up for scrap, and he contemplated putting it on display in Kenilworth, but space was limited. Clark sold No.15 to F. Nelson Blount in May, 1959, and it was shipped on June 5, to Wakefield, Massachusetts. Once in Massachusetts the locomotive was put on display, but then Blount had his steam locomotive collection to Keene, NH, then to North Walpole, NH, and finally to Bellows Falls, VT. While in North Walpole, No.15 was overhauled and put into service for Blount's tourist line, the Monadnock Northern. In 1962-1963 starred in a movie titled, "The Cardinal" and ran to Boston for the picture. After Blount's death in 1968 the locomotive was put into service on the Green Mountain Railroad. In January, 1973, Steamtown obtained a flue extension and installed a new piston and piston road. And the locomotive was leased out for a couple days for a wealthy couple's wedding in Boston. In August, 1973, the locomotive's front was modified, when its headlight was center mounted and number plate placed underneath the headlight. It only operated shortly with this appearance for on August 12, 1973, during "Friends of Steamtown Day" while the locomotive was triple-heading, broke a flue, and badly scalded veteran engineer, Andy Barbera. That was the last time No.15 operated. In 1987, the locomotive moved to Steamtown's new location in Scranton, PA and has remained there since, and it's headlight was high mounted again. Not much work is needed to restore the locomotive to operation. The locomotive is currently not in it's RV paint scheme. No.16 has two special distinctions on the Rahway Valley. It was the first diesel on the RV, and it had the longest operating span on the railroad, longer than any other locomotive, an impressive 38 years. No.16 was purchased new from General Electric in 1950 for $100,000, and in January, 1951 it was built and on January 29, 1951 it arrived at Aldene Jct. from the plant in Erie, PA. It immediately replaced No.14, and put Nos. 13 and 15 on standby. The locomotive arrived in a darker shade of red with yellow stripes and lettering, a scheme it would maintain for 24 years. No.16 was joined by No.17 on February 2, 1954, and No.15 was sold in 1959, then after the RV was a diesel only line. Nos. 16 and 17 worked doggedly through the 1960s when the Rahway Valley conducted a fairly busy freight business. In 1975 after the death of RV president, Robert G. Clark, Bernard Cahill became president and had the locomotive painted in identical maroon and white paint schemes. The two locomotives looked very handsome when for a week in 1980 they pulled passenger coaches for the U.S. Open at the Baltusrol Golf Club. In April, 1986, the Rahway Valley companies became property of the Delaware Otsego System when the line couldn't purchase liability insurance. No.16 became property of the DO and for another three years it worked it's home rails until in 1989 it was replaced by larger EMD power and Nos. 16 and 17 worked in Binghamton, NY, Passaic, NJ, and Cooperstown, NY to name a few. Then in 1995 the DO donated the locomotives to the United Railway Historical Society. They sat in storage in many place before in the early 2000s the Whippany Railway Museum leased them from the URHS, and so far No.16 has been cosmetically restored. 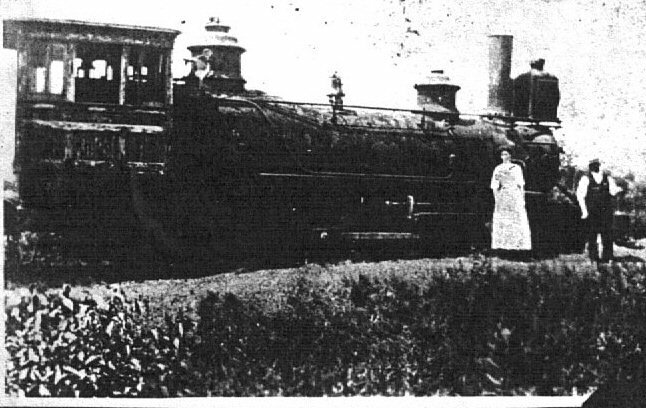 No.17 was the last locomotive purchased by the RV and ended all steam operations on the line. No.17 was purchased new from General Electric in 1953 for $100,000, and in January, 1954 it was built and on February 2, 1954 it arrived at Aldene Jct. from the plant in Erie, PA. It permanently retired No.15 on the RV. The locomotive arrived in a dark forest green with yellow stripes and lettering, a scheme it would maintain for 21 years. No.15 was sold in 1959, then after the RV was a diesel only line. Nos. 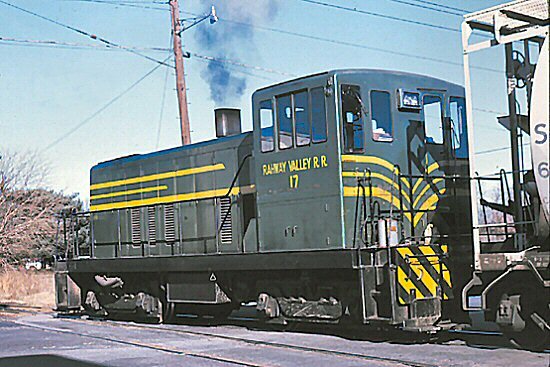 16 and 17 worked doggedly through the 1960s when the Rahway Valley conducted a fairly busy freight business. 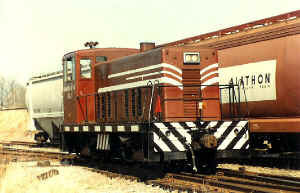 In 1975 after the death of RV president, Robert G. Clark, Bernard Cahill became president and had the locomotive painted in identical maroon and white paint schemes. The two locomotives looked very handsome when for a week in 1980 they pulled passenger coaches for the U.S. Open at the Baltusrol Golf Club. In April, 1986, the Rahway Valley companies became property of the Delaware Otsego System when the line couldn't purchase liability insurance. No.16 became property of the DO and for another three years it worked it's home rails until in 1989 it was replaced by larger EMD power and Nos. 16 and 17 worked in Binghamton, NY, Passaic, NJ, and Cooperstown, NY to name a few. Then in 1995 the DO donated the locomotives to the United Railway Historical Society. They sat in storage in many place before in the early 2000s the Whippany Railway Museum leased them from the URHS. No.17 is reported to be operational, and is currently in primer awaiting it's new coat of paint.